Scott Oudsema may have never won a major singles title, but being the number one doubles player in the world is enough to be impressive, especially when the ranking came with a Grand Slam Trophy. The only national singles titles Scott Oudsema has won were at the St. Louis Gateway and Columbus Indoor Championships, the last of which was 2001. Despite this, he has managed to keep at the top of the USTA National Rankings (he is currently No. 6) by consistently placing in the top eight at tournaments like the Super National Hardcourts and Orange Bowl Championships. Still, his biggest accomplishments of all have come in international doubles competition. 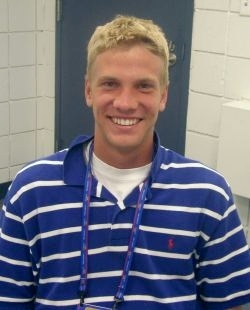 Seventeen year old Scott Oudsema, mostly with partner Phillip Simmonds, has won doubles crowns at the Australian Open, the Australian Hardcourts, the Yucatan Cup and the Orange Bowl. And that's just in the past year! The Michigan teen has traveled the world and back using his six foot plus frame to command the net. I sat down with Scott at the US Open while he was waiting for the rain to stop so he could play his second round singles match. Scott was ready to win a Grand Slam in his home country and had brought his whole family for support. Unfortunately, just after our interview, the tournament directors decided to cancel the doubles event because of all the bad weather, putting his dream of winning off to next year.